In this Lunara Build Guide, we provide an overview of her strengths, abilities and talents. 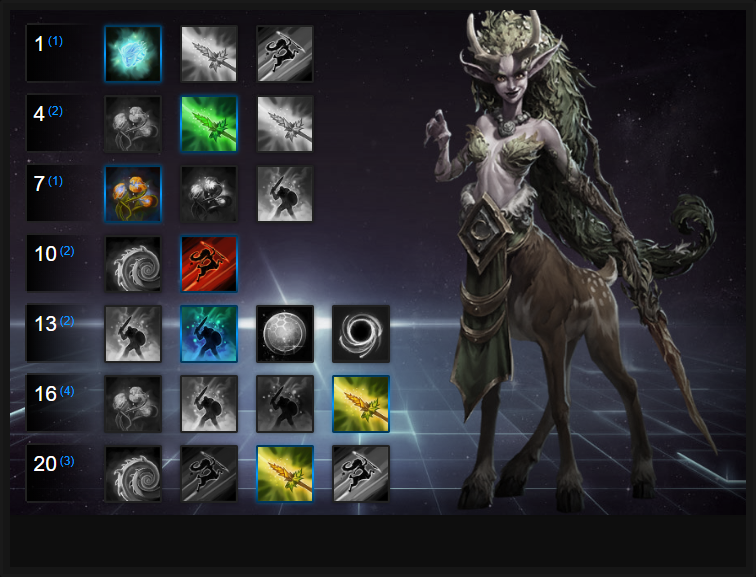 Lunara is a ranged assassin and unlike other Heroes who have similar "tags", she actually focuses on damage over time rather than burst. Similarly to Nazeebo, she poisons enemies with her basic abilities and can then trigger this poison to cause an effect. Unsurprisingly, she's incredibly squishy and has a very low health pool. Despite that, she's able to provide heavy sustained damage across multiple targets - it isn't uncommon to see her dealing the highest Hero damage by a huge margin. In addition to this, she doesn't utilise a mount and instead has a base movement speed that's 20% faster than everyone else. In comparison to other assassins, I think Lunara is particularly challenging to play. Although she is ranged, her lack of burst means you have to spread your poison across multiple enemies and you have to know when to trigger its effects. There's also a need to take great care against many Heroes (certainly any that can root you) as you're so vulnerable. Fortunately for Lunara, she gains access to a Wisp which she can project to any location of her choosing, allowing her to gain much needed visibility. Nature's Toxin (Trait) - is Lunara's trait and it allows her to place a stacking poison on an enemy after every basic attack. She can place three stacks on a single target: its duration will increase from 3 seconds to a maximum of 9. It's incredibly important that you make use of this added pressure as it'll provide prolongued damage to a target over a pretty lengthy period. If you can and once you've got 3 stacks on a target, switch to someone else. Note that a single stack is displayed under a heroes feet, as a green leaf. Each leaf reflects a single stack. Noxious Blossom (Q) - is the only spike-ability available to Lunara outside of her Heoric. It allows you to place a small blossom on the ground that explodes after 0.5 seconds. Its radius isn't huge so you need to aim it well for maximum damage. I will add that although its burst isn't amazing, it's a good amount of pressure that can cause your trait to affect multiple players. Its radius does make it tricky to aim, but with practice it's an invaluable tool for early game poke. Crippling Spores (W) - is directly paired with Nature's Toxin and allows you to slow any enemies affected by your trait. In addition to this, using Crippling Spores prolongs the duration of your trait on the enemy by 3 seconds. If you can, try to use Crippling Spores when you've covered the enemy team in your trait so that you add additional time to your poison. A good way to secure two instant stacks is to use Noxious Blossom > Crippling Spores. Wisp and Relocate Wisp (E) are the same skill. The first allows Lunara to project a Wisp to any location of her choosing. Once commanded, the Wisp will slowly work its way to where instructed and once there, it will remain and provide vision. Lasting 45 seconds it will then disappear and it can also be killed by the enemy. Relocate Wisp allows Lunara to move the Wisp once every 5 seconds to a new location. You should make as much use of Wisp as humanly possible - it's invaluable if used properly. Thornwood Vine (R) is a high pressure Heoric ability that allows Lunara to fire vines in a straight line. All enemies in that line take damage and with three charges that can be used rapidly - with a long range - it allows for a spike against a single target or group of enemies. It's undoubtedly the "safer" of the two Heoric abilities and will compliment most compositions. The main reason why it's so strong however is that anyone affected by it, will be poisoned. Quick use of Crippling Spores after then gaurentees 6 seconds of poison time, as well as a slow. It's the main reason why Lunara has such good poke. Leaping Strike (R) is her second Heoric ability and one that's orientated around single targets and mobility. With two charges, it allows Lunara to leap over a target and snare them whilst dealing massive damage. Lunara can also chain this ability to leap great distances (leaping over two targets using both charges). Unfortunately you aren't immune to crowd control during this jump so one wrong move and you'll be stunned or rooted. It's also worth noting that you also take damage from basic attacks during the jump. Vision is often key for Lunara and regardless of who she is facing, Natural Perspective is exceptional. It allows you to see any enemies affected by your trait, allowing you to still hit them if they hide in a bush or vent. It's invaluable at keeping players covered in poison but also lets you play that little bit safer if someone does attempt to hide. Allowing Lunara to sustain herself when she inflicts her poison on enemies or Heroes, the health return of Siphoning Toxin is significant (over 35 health per second). For lane sustain, or during prolonged team-fights, it ensures Lunara has far greater survivability while poking the enemy down. Many players utilise Wild Vigor and whilst a 50% increased output to your basic attack damage is great, Splintered Spear is actually a brilliant Talent for several reasons. Yes Wild Vigor offers slightly higher damage per second however, that's only single target and without factoring in your basic attacks from Splintered Spear against enemy Heroes. When you poison four enemy Heroes and follow this up with Crippling Spores and Unfair Advantage (below) it's actually a much higher damage choice with far more utility. Variable: For single target damage, Wild Vigor is a must. Increasing your next 4 Basic Attacks by 50% it allows you to deal high spike damage in a very short window. Particularly good against two tank compositions. Leaping Strike allows Lunara to jump over one enemy and with two charges, she can effectively spring over one or multiple foes to use up both charges. The damage from the strike is high and it also massively slows the target by 85%. Although you can still take damage while leaping, it does allow you to escape when being focused if you use Leaping Strike early enough. Best of all, it ensures that you can reposition and keep using basic attacks against a slowed target when you land. Very strong 1 on 1. Variable: Thornwood Vine is a strong variable as it allows you to quickly chain three lengthy and powerful attacks against your foes. The fact you can rapidly fire them against a group or single target make it especially strong. The fact anyone you hit is also affected by your trait allows you to pressure enemy teams for lengthy periods of time. Its cooldown to recharge is also fairly short. Building on Lunara's ability to slow enemies, Let Them Wither increases Crippling Spores duration by 1 second, and ensures it doesn't decay. For controlling the enemy team, and maximizing your poison damage, it's amazing (especially with Splintered Spear). Variable: If you're against Lt. Morales or a very range heavy team (who has Li Ming) take Star Wood Spear. You can then poke with Thornwood Vine, infect players with your poison, trigger Crippling Spores and attack them from miles away. It's awesome for pressuring such a range heavy composition. Alternatively and for rapid attacks versus double Warrior compositions, if you took Wild Vigor, grab Invigorating Spores. Intensifying Toxin builds on Let Them Wither and Unfair Advantage. Anyone with 3 stacks of your poison suffers 40% increased damage from it, meaning anyone who is slowed - for 4 seconds - is going to take absolutely massive damage. These Hero Threat Levels (1 being lowest threat and 10 being highest threat) are to help you determine which enemy Heroes can give you a headache. For the Heroes listed here, take extra care as they're particularly dangerous for Lunara. Genji: His ranged poke combined with Deflect and mobility ensure he's a frustrating Hero to deal with. Kael'Thas: Gravity Well can really ruin your play as Lunara as it allows Kael to deal huge damage to you with little means of escaping. Kerrigan: Not surprising, Kerrigan is incredibly strong against Lunara because of her pull and disruption. You can hurt a lot, but she'll bring you down much quicker once she's near you (her leap is also very annoying). Leoric: Purely because of his self healing and ability to slow you, Leoric is a real nuisance that you'll never really be able to kill, though you can kite him easily. The Butcher: Lamb to the Slaughter combined with Butcher's Brand will absolutely destroy you. You've no means of getting away from him and his self healing is far superior to anything you've got. Thrall: His Chain Lighting combined with his root and Windfury can wreck you in seconds. Avoid him at all costs. This list of tips and tricks are just a handful of things we think will help your Lunara play. We'll continue to add to the list as required and if you have any tips you'd like to share, let us know in the comments below and we'll place them here. 1. I really cannot recommend enough your need to use Lunara's Wisp. Its vision is a game changer and the fact you can move it allows you to constantly keep an eye on high risk areas. 2. Always try to place your Wisp in locations where you think the enemy will come from or to investigate an area you want to move to. 3. Lunara is very squishy - she can die almost instantly against many Heroes. Stay near your team and avoid damage with your mobility. 4. Although you gain a 20% movement speed by default, you're slower than your team when mounted. Factor this in on objective heavy Battlegrounds. 5. Being DOT based might make it appear like you're doing little but it's actually a lot of pressure on an enemy healer to keep up with. Keep laying on your trait to all enemies with your basic attack. 6. Rapidly firing off your Thornwood Vine against a close group of enemies is totally viable but you still need to target the weakest. 7. Use your innate speed to kite melee characters. It's only really The Butcher who can counter this speed with Onslaught and Thrall can be dodged fairly easily. 8. Always try to stay on the fringes of any fight - you're too squishy to get into melee range. You also need to be ready to escape. 9. I really cannot recommend enough the need to practice Lunara's basic attacks in Quick Match or against AI. She has a strange walking animation that takes some getting used to (she hops everywhere) and you need to factor this in when engaging. 10. Keeping track of your trait stacks on an enemy is indicated by leaves under their feet (3 indicating maximum stacks). It's hard to keep track of during a fire-fight but this comes with practice. 11. Remember that Noxious Blossom is your main spike skill - it's a high damage, small AOE explosion. Use it against enemies that are slowed. 12. If you can lane one stack of your trait on an enemy, applying Crippling Spores adds another 3 seconds to its duration. It's instantly 6 seconds of trait pressure. 13. Try to always spread your poison to as many targets as possible, securing the 3 stacks. This ensures maximum pressure.